European suppliers play a key role in the new Nissan Cube's powertrain. France's Valeo SA provides the clutch and hydraulic systems for the subcompact's manual transmissions. Germany's Kolbenschmidt Pierburg AG produces the pistons for the Cube's 1.5-liter diesel and a 1.6-liter gasoline engines. Britain's TI Automotive Ltd. and A. Raymond S.a.r.l. of France supply the fuel system. 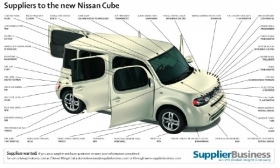 Unlike its predecessors, the third-generation Nissan Cube will be launched in Europe. Sales are expected to start late this year or early next year. The Cube's diesel engine is mated to a six-speed manual transmission, while the gasoline unit comes with either a five-speed manual or a continuously variable transmission. The CVT was co-developed by Nissan and its affiliated transmission supplier JATCO Ltd. The Cube is based on Nissan's B platform, which is also used to make the Micra subcompact.